Crisafulli offers 53 standard models of its hydraulic submersible self-priming pumps in sizes from 2 inches to 10 inches, with flow capacities between 200 GPM and 3,800 GPM, Total Dynamic Heads (TDH) between 10 feet and 120 feet, and Solids Passing Capabilities to 3 inches. Removal of industrial and municipal effluents, mine tailings, raw sewage, storm water. We call our rugged, reliable, long lasting, self priming Crisafulli Hydraulic Pumps "industrial strength" because they handle the tough jobs - biosolids, residuals, mud, raw sewage, sludge, and more. We build our Crisafulli Hydraulic Pumps in three Models - Standard Duty, Rugged Duty, and Severe Duty. Each Crisafulli Hydraulic Pump has a Crisafulli Impeller Inside, your assurance of quality and value in pump performance. "We've run our pumps in an environment that would destroy almost anything with moving parts. This hostile atmosphere did not challenge the incredible performance of our Crisafulli pumps." Mike Green, West Pac Environmental. Flexible - can be powered by almost any hydraulic equipment, or we can build a power unit for you. 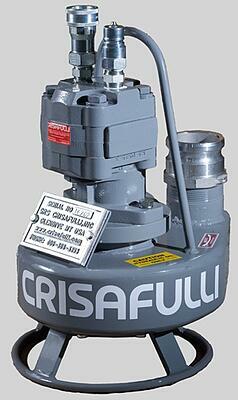 Rugged construction makes a versatile Crisafulli Hydraulic Pump one of your most durable pieces of equipment. It's easy to set up, easy to use and easy to maintain. It doesn't need priming or suction hoses. It immediately begins pumping at capacity when you submerge it. Harness the power of a Crisafulli Hydraulic Pump with tractors, backhoes, Cats, small construction equipment or one of Crisafulli's Power Units. Choose from three pump Series. Crisafulli S-Series Pumps are our smallest and most portable. Crisafulli J-Series Pumps efficiently handle higher volumes and more solids. Crisafulli L-Series Pumps are the ideal choice for the highest flows. Add a slurry gate to help handle dense, crusted material. Open the slurry gate to mix and agitate; close the gate and pump the waste away. Crisafulli Severe Duty Hydraulic Pumps feature a totally enclosed, oil filled bearing frame that prevents shockloads from reaching the motor.